The Korean giant Samsung has revealed an event through its communication channels to be held in London on 20th June. 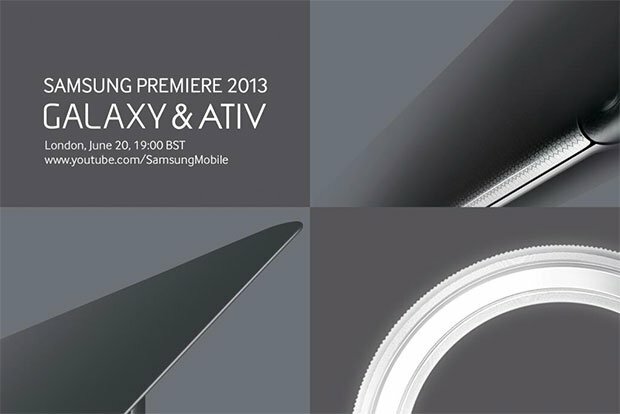 The event called Samsung Premiere 2013 will feature devices from Galaxy and Ativ series. The Galaxy is the Android-powered series of Samsung while Ativ pertains to Windows 8 devices including Smartphones, tablets and hybrids. The company put up a teaser invite with segments of device pictures. The image in the upper right corner seems to be like a back of a laptop or a close up of a textured back of a Smartphone and the one in the lower left looks like a lid of a tablet/laptop hybrid. As Samsung recently announced that it will extend the Ativ branding to include Windows 8 PCs, we guess that the tablet/laptop hybrid will run on Windows 8. Samsung is expected to launch the variants for its flagship Smartphone Galaxy S4 including a ruggedized variant Galaxy S4 Active, a small variant Galaxy S4 Mini and a camera-centric variant Galaxy S4 Zoom. As it can be seen in the image on the bottom right, it is a camera lens. Since neither Galaxy nor Ativ series including Galaxy Camera has such a lens on its body, we suspect that it might belong to the upcoming Galaxy S4 Zoom. Galaxy S4 Zoom is expected to come with an 10x optical zoom and previous rumors put its launch in mid-June which is close enough to 20 June to make it a strong possibility. Samsung recently mistakenly revealed Galaxy S4 Mini on its Samsung Apps website. So to sum it all up, we put our bets on a new Galaxy Smartphone, possibly Galaxy S4 Mini or Galaxy S4 Zoom, a new Windows 8 tablet/hybrid and another tablet or a Smartphone. The event will start at 19:00 BST on June 20 and most likely be streamed live via YouTube. In related news, Samsung launched its Galaxy Mega 5.8 and Galaxy Mega 6.3 in India. Samsung priced Galaxy Mega 5.8 at Rs 25,100 (US$450) and Galaxy Mega 6.3 at Rs 31,490 (US$565), which is comparatively less than its price for the UK. Samsung is looking to invade emerging markets after it has established its league in America and Europe. Follow us on Twitter, Google+ and Facebook to get updated news as and when they happen related to phones, tablets and gadgets.